It was a cold night. I could tell even curled up in the back of the rental car, because my 40-degree-rated sleeping bag wasn't enough to break the chill. 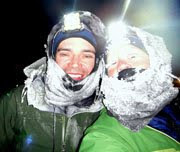 Beat and Dmitry arrived at Valtournenche, kilometer 236, at 5 a.m. and informed me that they planned to eat and run. However, once inside the tent, we learned that the race organization had paused the race, citing extreme weather on the higher passes. I strove to eavesdrop on the volunteers' Italian chatter, but the most we could make out was 110 kilometer-per-hour winds and repeats of the word "Malatra," a high pass that was still a day away for Beat. We guessed there was lots of new snow on that pass. Beat and Dmitry took advantage of the suspension to grab an unplanned nap, while I lingered in the tent to continue to eavesdrop on conversations I couldn't understand, and also chat with another American runner, Dan from Bellingham, Washington. Dan had way too much energy for 5 a.m., let alone being a Tor des Geants racer at 5 a.m. He was panting at the gate like an Iditarod sled dog, almost manic with a desire to be released. It was actually humorous to watch, as he was also too exhausted to realize he was full-on rambling at a rather impressive rate of words per minute. Finally, just before 9 a.m., the volunteers announced the race was back on. A few dozen runners who had backed up at the checkpoint lined up for the restart. 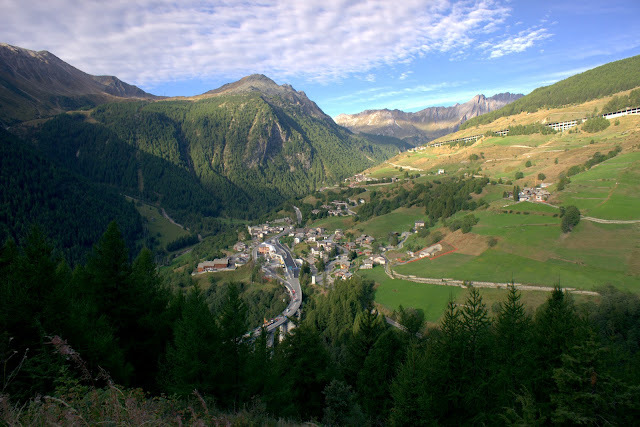 Valtournenche is an strange village. There essentially was no available land, but people built a large town on the mountainside all the same. Several ten-plus-story buildings are stacked up the hill like a staircase, and many of the residential zones are only accessible by stone steps. Just for fun, I followed Beat and Dmitry up the trail out of town, but within five minutes I felt distressingly bad. My breadsticks-and-jam dinner didn't really hold me over, and I'd been up for more than four hours with no breakfast. My blood sugar was so low that I felt dizzy and my legs were wobbly. I was tripping all over myself on the stairs, and finally had to announce to the guys that I couldn't keep up so I was turning around. Indeed, I was a pathetic case. Somehow I got the car back to Courmayeur and crashed hard for the afternoon. It's been a while since I've been so tired. I was less tired after I finished UTMB. It's humbling to me because what I chose to do this week was a fraction of what the Tor des Geants demands. And yet I was shattered. I took two or three fitful naps, but always woke up after fifteen minutes or so, drenched in sweat, with harrowing memories of the last scene of some terrible nightmare. These naps were far from restful. In one of the nightmares, I found a bunch of infant kittens floating in a toilet in a checkpoint restroom. Most of them were dead but two were alive and I rescued them, but I was so upset about it that I didn't even know what to do. So I just ran around the checkpoint asking volunteers if they had any blankets for the kittens, and no one would help me. It was horrible. I rarely have nightmares, let alone about something so random as kitten homicide. I must have been really overtired. The nightmares and the weird naps left me feeling almost feverish, and I genuinely had to get outside. It was after 5 p.m. so I set out for a "short" hike up to the ridge above Rifugio Bertone, where I hoped to catch the sunset. It was a beautiful evening but cold, deeply cold. By the time I ascended above timberline, the ambient temperature must have been near freezing, and winds were blowing around 30 miles per hour. I thought about all the TDG racers out there fighting these conditions, adding yet another layer of difficulty to the battle. And indeed, there would be more late drops from respiratory infections, and most racers had to deal with painful coughing and bouts of mild hypothermia. 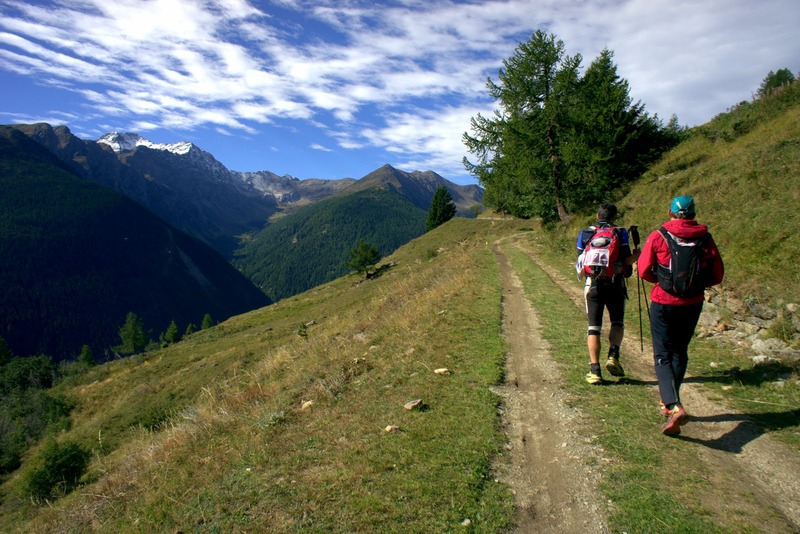 Why trail running is energizing rather than exhausting — I stand by this theory. This grassy, rolling ridge above Val Sapin is one of the few "runnable" trails close to town. 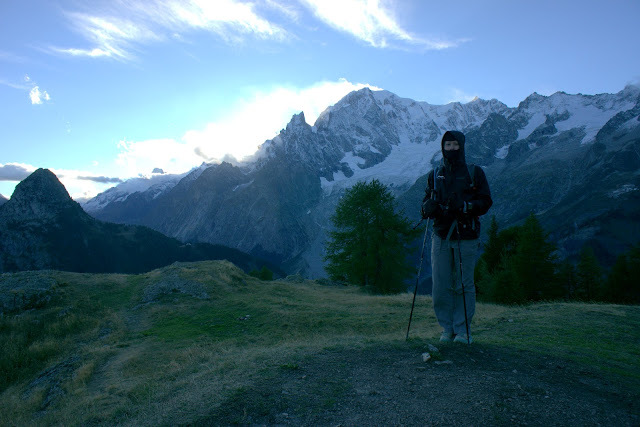 I was feeling more energetic, and also fairly chilled, so I broke into a jog and then a full run as evening light crept up the glaciers of Mont Blanc. It was breathtakingly beautiful. The bad energy I'd accumulated earlier in the day melted away. All it took was another healthy dose of elevation. Thursday was another night of short sleep as I prepared to meet Beat in Ollomont, but ultimately missed him because he was unexpectedly fast into that checkpoint. One of the most surprising things I observed in the Tor des Geants is the way Beat seemed to grow stronger as the miles and climbing stacked up. He was still in a lot of pain with his shredded feet, but as long as his body was pumping out endorphins, he was climbing well and even occasionally running down hills. His splits were becoming harder to gauge because already he was covering ground faster than he had late in the race in 2011, and continuing to improve on his improvements. Because this race came directly after the beatdown of the PTL, it seemed as though he had descended into the depths of physical depletion and discovered that the bottom was actually just the other side of a sphere, then emerged into new sunlight, healthy and strong again. He'll beg to differ with this convoluted theory, but this is how it appeared to me and other observers — he was getting stronger. Maybe longer really is better. Beat and Dmitry travel the final 10-kilometer gradual road descent into St. Rhemy. I was already planning to meet him at the 303-kilometer checkpoint, St. Rhemy, when I learned of another race rumor that Col Malatra ultimately proved to be impassable, and race organizers planned to end the race there, thirty kilometers short of Courmayeur. I frantically researched the situation as best as I could at 4 a.m., and learned that dangerous ice conditions coated the steep trail to the pass. Mountain guides set out to chip steps into the icy snow, but determined that the trail could not be safely crossed without winter equipment such as an ice ax and crampons, which no TDG racer had. 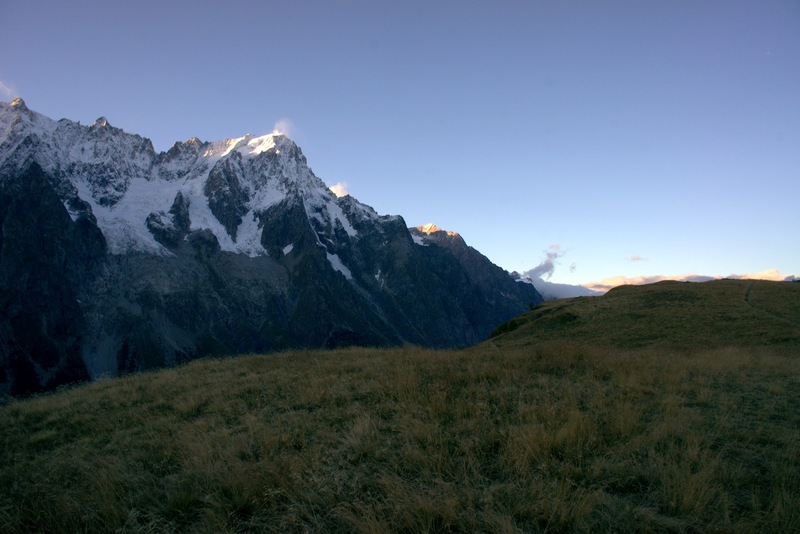 About sixty frontrunners had made it into Courmayeur, most who crossed the pass during the realitive warmth of the day. But already at least one racer had been injured during a night crossing, badly enough to be helicopter evacuated from the pass. There was no way to safely manage the 300-plus runners still making their way toward the finish, so the hard decision was made to move the finish line to St. Rhemy. The final miles into St. Rhemy were a gradual dirt road descent, something that must be a mental battle of boredom for tired runners. For me, it was a pleasant early morning walk. I sauntered up the trail and intersected Beat about four miles from town. He too had heard the news that the race was ending in St. Rhemy, and, in learning the punishment was about to end, his brain shut down the endorphin production. His was in a world of hurt and not happy. I made the mistake of misjudging the length of a climb, and received a long and stern lecture about the demoralizing powers of misinformation. I don't blame Beat for his mood. I also can't hide my crankiness when I am in pain. Beat signing the famous poster that all finishers sign. Still, (most of) the crankiness dissolved the second he crossed the finish line. Beat finished 166th of 630 starters and 392 finishers, not a bad result for a 2012 PTL finisher. I asked him if he was disappointed about missing the last pass and final thirty kilometers into Courmayeur. He said no, because he'd already finished the TDG twice. Plus, the thirty kilometers over Col Malatra is almost a victory lap at that point. While parts of it are steep and the pass is high, there is nothing particularly challenging about that section of trail (unless of course it's covered in ice.) "Once you've reach St. Rhemy, you know you can do it," Beat said. "So it feels like the finish already, in a way." We also learned that Beat is one of 18 people to have finished all three runnings of the Tor des Geants. He said this means he has to go back next year for a fourth. Oi. Big congrats and respect for Beat for showing once again mind over body matter. Jill, are you in Courmayeur now? Thank you for your hard work of crewing and helping Beat to endure! 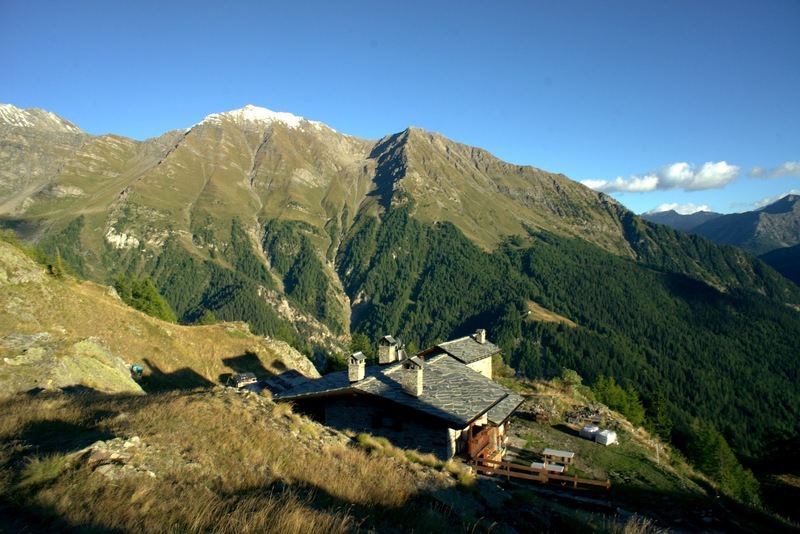 I love your reports and breathtaking pictures that are a wonderful compliment to the Valle d'Aosta and its surrounding Alps! infant kittens floating in the toilet? that is the kind of dream you wish you can't remember. great write up...can't believe he did this after just completing PTL. Luca, we just left today. Did you watch the tdg awards ceremony? 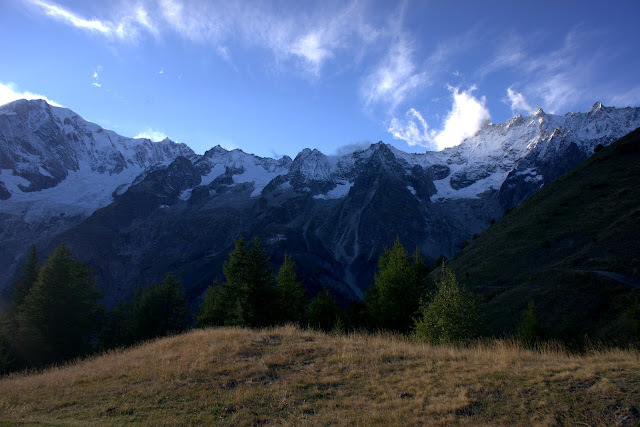 Love courmayeur, can't wait to come back. Hello Jill, I was right in front of the stage with wife and son. The ceremony has been wonderful and very moving, unfortunately we had to pull out at one point because the music was a bit too loud for my son. I wanted to see when Beat was callee when the "role call" was done, but there was dinner to be prepared (our home is on the narrow street right on the back of the Ange plaza where the ceremony was held). Let us know the next time you're I'm Courmayeur!